Following a specific routine before you head out to jog each time keeps you safe and reduces your risk of injury. Jogging when unprepared may make you more susceptible to environmental threats, such as inclement weather or people who present a threat to your safety. Use a specific pre-jog checklist to ensure your workout is comfortable, successful and incident-free. Food eaten before your workout gives your body the energy to maximize your effort and avoid hunger mid-run. The timing of your meal or snack affects your jogging workout. Eating right before your jog could cause stomach discomfort. 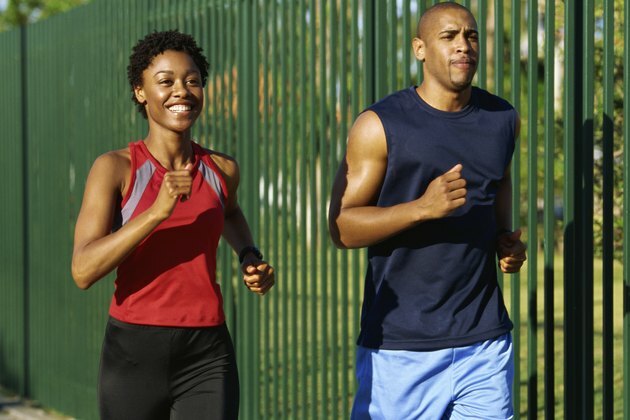 Choose a high-carbohydrate snack with low fat content about an hour before you head out for your jog. 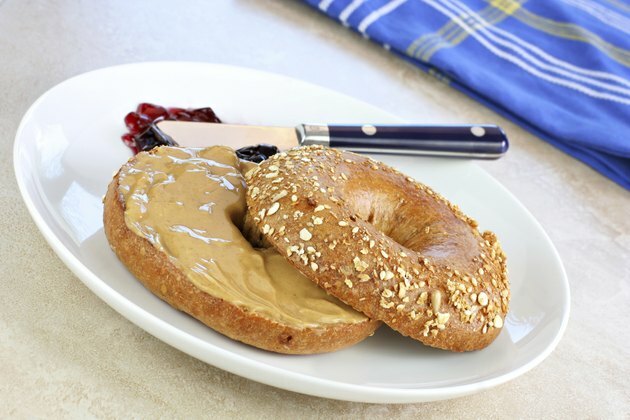 A whole wheat bagel with peanut butter is a good example of a high-carb snack that also provides protein. You may get thirsty when you jog, but you should start hydrating the body before you step out the door. Drink water before you leave for your run so your body isn't dehydrated to start with. If you plan to jog for longer than 30 minutes, take water with you or stop along the way to rehydrate. Replenish your fluid stores again when you return from the jog. Wear clothing that is comfortable and allows you to jog without restriction and consider the weather when choosing what to wear. Too many layers may cause overheating. Apply sunscreen, regardless of the temperature, to avoid a sunburn. Your running shoes should also fit comfortably while providing support to your feet. You should know your route before you head out for your jog; choose an area with which you are familiar, if possible. Pack a form of identification in case you become injured and carry a cell phone, calling card or money for a pay phone in case you need assistance or become lost. The warmup is key in preventing injuries. Walk briskly for the first few minutes to loosen your muscles and get the blood flowing. Another option is to warm up at home before you head up with jumping jacks or similar moves. Account for the warmup period when planning your jog to allow yourself enough time for the entire workout. Is it OK to Go Swimming With a Sprained Ankle?